It’s that time of year again: weekend trips, destination weddings, and family vacations are calling. Traveling with kids has a ton of challenges, but with these handy tips, packing their clothes won’t be one of them. Use packable shelf stackers to keep kids’ clothing separated. I have boys who are all two sizes apart. This means it’s sometimes not easy to tell whose clothes belong to whom, and the last thing I want to do when I’m packing on vacation is spend time reading tags and having to sort through clothes. Simply pack these shelves with clothing, and when you arrive at your destination, just unpack and by hanging up the entire shelf. We color code with different colors for each kid and everything stays separate and organized. Packing cubes work similarly, but they are also great for maximizing space. Once clothes are packed, excess air is release to get the most out of your suitcase space. These are also great for traveling with babies or young infants who have tiny, little clothing. Cubes keep everything together and color coordinated as well. Roll with it. The world is full of roll devotees, those who say that folding is time consuming and ineffective. Rolling keeps clothes wrinkle free and it’s also easy to recognize each item at a glance. This technique might come in handy for a wedding, photo session, or event where your kids need to look wrinkle-free and put together. Use Ziplock bags. Separate older kid’s outfits for each day (underwear, shirt, shorts, etc.) into a different gallon Ziplock bag. This may be a little labor-intensive on the home side, but it will make it easy for them to simply grab a bag and get themselves dressed once you’ve arrived at your destination. Pack PJs separately so they can get themselves ready for bed after their bath or showers. Again, this is probably best for smaller clothing—by the time your kids clothes are too big to fit into gallon bags, they should maybe be ready to pack their own clothes! Skip whites. This tip might not exactly be a luggage hack, but you’ll thank me, I swear! Whenever possible, pack the darkest colors/patterns possible when traveling with children. White and light-colored clothing gets stained easily and having to trek to a bathroom to change on an airplane or stop on a car trip is never fun. This goes for fancy fabrics or complicated outfits too—save those for home. And parents should wear dark colors as well! The last thing anybody wants to do on vacation is arrived looking ragged. What do you think? Have you tried any of these packing hacks? 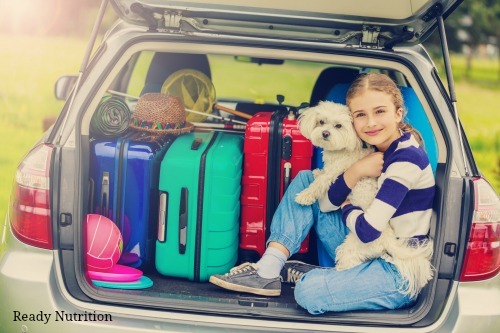 Do you have your own system for packing your family’s clothes for a trip? Share in the comments!